Makha Bukha Day is an important Buddhist holiday in Thailand celebrated on the full moon of the third lunar month. 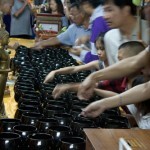 Many Thai people will visit the temple on this day to take part in candle lit ceremony. We visit the famous Wat Chedi Luang temple in Chiang Mai for the event where hundreds of people form a procession round the temple led by dozens of monks.